The Mountains are looking beautiful at this time of year – there is often snow on the tip of the Berg, Giant’s Cup and Giant’s Castle glow red in the mornings, and volunteers wake up in their cosy Basotho Rondavels (thatched round houses) to a fabulous view and amazing sunrises. Most days the temperature still rises to the mid-20’s and 30’s, so its lovely and warm during the day, and the sunshine makes any outdoor tasks involved in the day’s work all the more enjoyable. The education support programme has gone from strength to strength, with international experts assisting with syllabus development at Beersheba primary school, and volunteers helping in classrooms working with learners of all ages. Highlights of the past term have been international days with grade 6 – each week, the school class is given a presentation by a volunteer from a different nationality, which involves learning some language (or colloquial terms! ), eating a national food and making national flags; the role model programme (which meets on a weekly basis) aims to inspire children of all ages to promote social good in their community, by performing good deeds once a week. This is important to develop a cohesive community using a bottom up approach. Even the smallest members of the group have instigated change in their communities, from taking fresh vegetables to elderly community members, to helping clean their communal land. The school and creche are still recipients of vegetables from a feeding scheme, and any surplus is used to support nutrition of elderly and OVC’s (orphan/vulnerable children) from the Mahaque community. We used some of the surpluss food produced within this scheme to provide a fabulous Christmas lunch for 80 children from Mahaque on Christmas day. The sporting ability of learners is improving, with volunteers running weekly PE lessons that include basketball, soccer, rugby, cricket and netball, and setting up sports days and inter-school matches across our district. 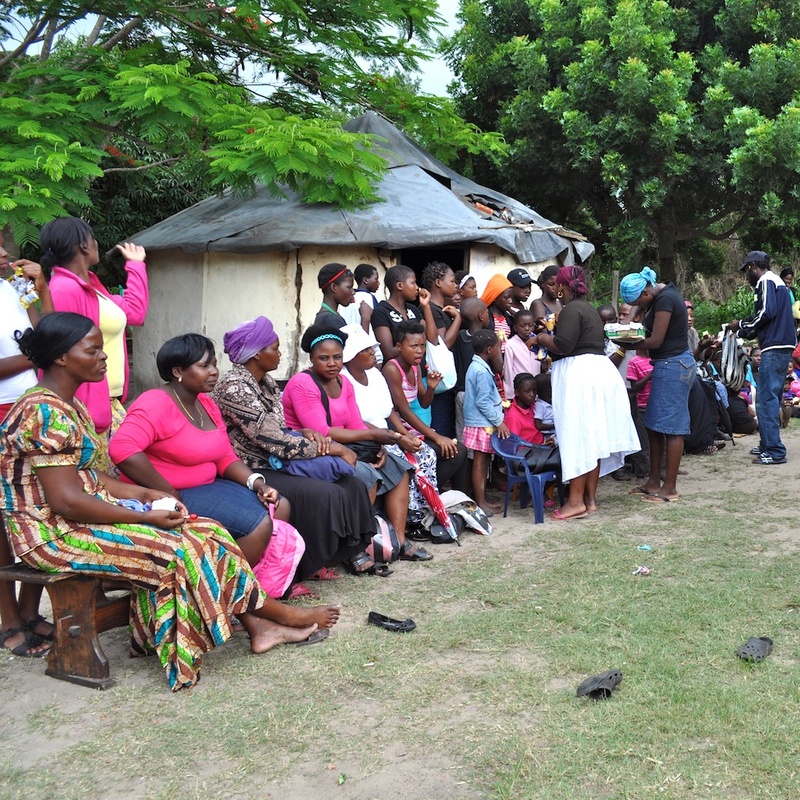 We work on a daily basis to promote the good health of our programme beneficiaries. This involves providing home-based support for treatment regime adherence, family health support and Life orientation lessons at school. Medical volunteers have set up gastro-health screening and treatment for young children, as well as TB awareness and HIV voluntary counseling and testing services throughout the community. This programme is monitored internally on a daily basis, and our most recent annual impact evaluation has identified strong improvements in general health, family nutrition and particularly TB screening, awareness and treatment completion. It is important in the field of international development to not just provide direct support, but also, where possible to provide opportunities and training in terms of sustainable livelihoods opportunities. A main focus of our work is to provide training for women who are either HIV infected or affected, in previously known crafting and arts skills. We have successfully identified 20 women for training in these skills, who will participate in a master craftswoman programme in August of this year. These skills will then be further transferred to 80 more women from Mahaque over the forthcoming 2014-2015 period. Beneficiaries of this initiative will be trained in crafts such as mohair weaving, basket making, sewing and pottery, to produce high quality products that will be sold in our identified outlets in Cape Town, London and locally. A two-week workshop run by a British artist and crafter will assist with the training programme. A fabulous group of volunteers from Australia made a start on a workshop for this initiative, and we hope to see it completed by the end of July this year. Over the forthcoming months, we are hoping to have lots of international volunteers join our programmes here in the Berg. Volunteers will have the opportunity to help in classrooms with children of all ages, provide support and child care at the Beersheba creche, work with orphans within the community, help out with the feeding scheme, assist with the promotion of good health, work on necessary construction projects including a new classroom for the school, play equipment for the creche and of course the completion of the workshop. As you can see we are very busy working to promote development within local communities in our district using the areas of education, healthcare and sustainable income generating opportunities. However, we still leave a little time for recreation. Evenings are sociable occasions, we light great big log fires in our indoor and outdoor fireplaces, and cook up a storm, serving delicious South African meals to our volunteers. Zulu dancers entertain new arrivals and Tembeka opens her home to welcome volunteers to enjoy evenings at her homestead, which include lessons in basic Zulu, traditional cuisine and home-made “Utshwala-BesiZulu” (you’ll have to join us to find out what this is…!). Weekends are free to relax on the riverside deck, do a spot of yoga, enjoy trips into the nearby Kingdom of Lesotho, hot springs and the mountain parks, or even skiing. Happy Christmas to all our volunteers and friends. 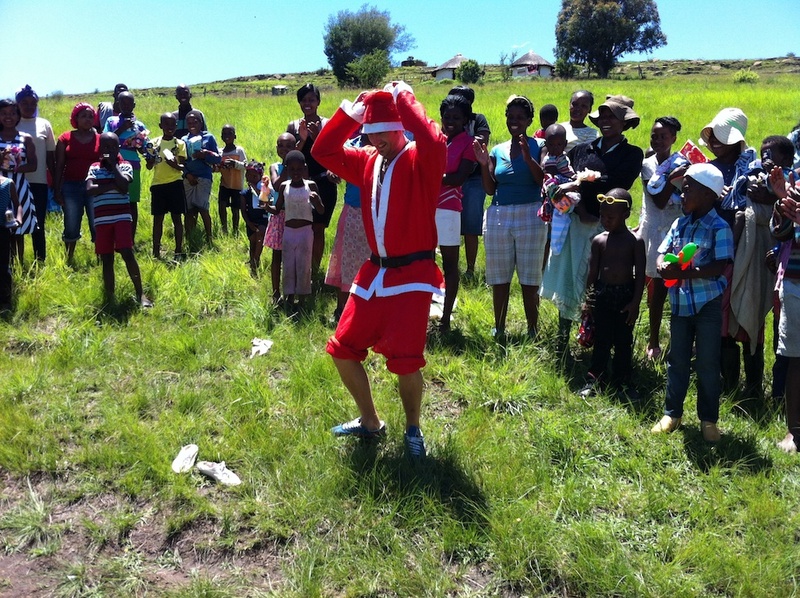 We hope you all have a happy and healthy 2014, and would love to see you in South Africa in the new year! Hike for health 2014, dates confirmed! We have final confirmation of the Hike for health 2014, dates. 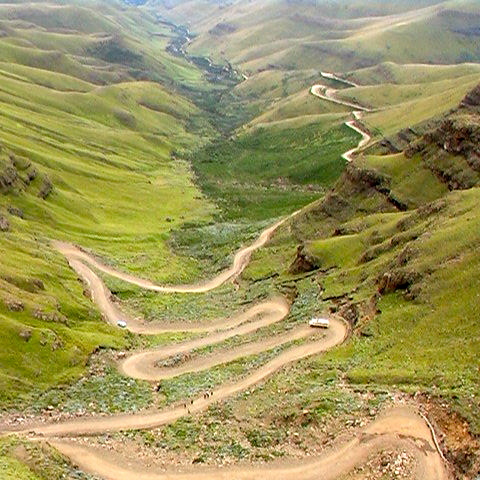 Participants hike through the Southern Drakensberg mountains, and Lesotho, raising awareness about TB. Arrival date for the hike is June 1st 2014, and departure June 13th. Flights should be booked into Durban King Shaka International Airport. There is an opportunity for participants to join our Three Countries Tour after the hike has been completed. This provides the opportunity to travel through the KwaZulu-Natal Province of South Africa, first stop St Lucia Estuary for wildlife tour and Hluhluwe for big 5 Safari. Through to Mozambique to swim with dolphins and enjoy the Indian Ocean, then on to Swaziland to stay in the stunning Mlilwane wildlife sanctuary and enjoy nature and culture. Volunteer in the mountains… Why not? Even more of a reason now – we’re solar powered! Come and visit us – we’re going eco. Once we got here, we realised that the cost of electricity installation far surpasses that of installing an all singing, all dancing alternative energy supply, so logic and finances automatically dictated that we immediately got straight on the blower to all the alternative energy suppliers here in South Africa. We have now opted for our first energy purchase to be a two solar panel system, providing a huge amount of amp hours daily. Later on, we’ll upgrade to a dual system, which will provide us with our own wind turbine to work in tandem with the solar units. So, as well as giving back to the communities you visit and stay amongst, whilst on holiday here in Drakensberg with us, you will be minimising your footprint, as we are using not only renewable energy sources but a sustainable water source for both household and drinking water too! What more reason do you need to come and volunteer with us in the Southern Drakensberg? Are you keen to get involved with an adventure challenge? something a bit different, that is physically demanding, interesting, different and does good at the same time? Join us and hike for health in May 2014. 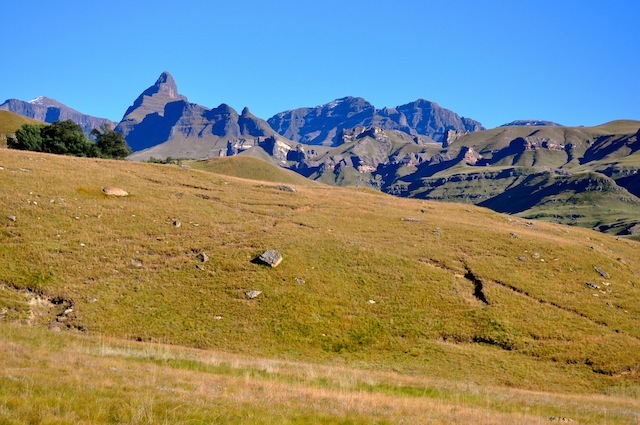 We are starting to advertise places on our hike for next year, we are aiming to get together a group of 20 participants, to raise money for TB awareness in the Southern Drakensberg. We will hike through the Southern Berg, and into Lesotho, spreading awareness about TB – the silent killer in our rural areas, moving between schools, creches, community groups and villages providing information about TB, prevention and services. The hike lasts 12 days, and begins and ends at Rivercroft cottage, in Pevensey, Underberg. Participants are required to raise a certain amount to participate, which covers all costs and a donation. If you would like to join us, or would like more information, please contact alex@mozvolunteers.com for more info! Please reblog for us to help spread the word! Natural clear, cool pools, waterfalls, springs, far up in the mountains, with a picnic on this scorching hot (35 deg c) day.